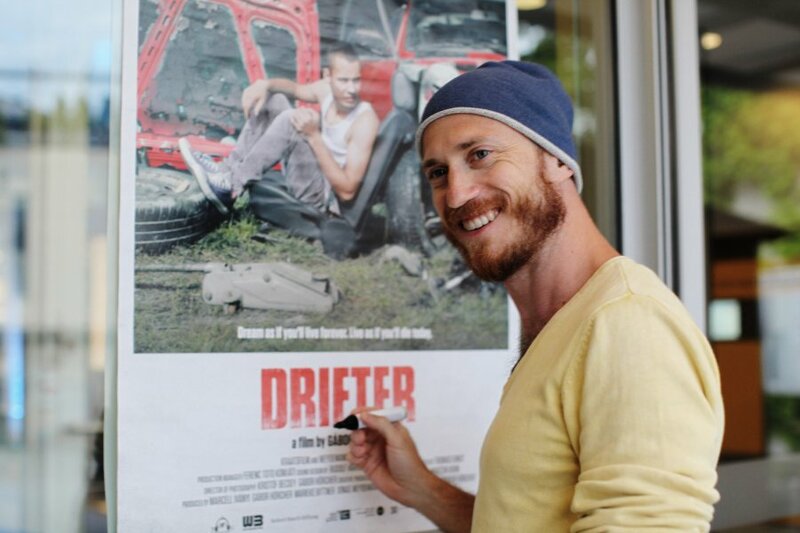 One of the recently most successful Hungarian documentaries is a film by Gábor Hörcher named Drifter that picked a number of prestigious awards, including an award from the largest documentary festival, IDFA in Amsterdam. A film about a rebellious teenager, Ricsi, who intends to race in a local rally although he has neither a driving license nor a functional car, was coming into existence for five years. During this year it can be seen on various uncommon places all over the Czech Republic – this is happening within the project KineDok organized by Institute of Documentary Film that also supported the film. I talked to the director Gábor Hörcher about the film right when he was going to see Ricsi. In contrast to the majority of directors you did not graduate from a traditional film academy but studied psychology and law, and for some time you also taught at a university in Cambodia. As a director of documentary films, did you receive more from such experience than from film schools? I don't know if I received more or less but for sure it brought me something else, and I'm very thankful for it. After coming back from Cambodia I also attended various film courses. In my opinion, it is very important for a director of documentaries to understand how a language of a film works. How did you first met the main character of your film? Previously I only worked on fiction and about six years ago I wanted to try something new, I wanted to shoot a documentary so I was searching for ideas. A friend of mine recommended me Ricsi whom he met when he led a summercamp for children in Ricsi's village 15 years ago. So when they had a brief Facebook conversation about Ricsi’s racing plans we agreed to go and meet him, and this was how it started. What persuaded you that Ricsi is the right and principal character for a feature documentary? Did you not doubt at the beginning whether you made a right choice? First, we shot a short teaser in two day. Ricsi was full with enthusiasm, and he seemed very lively to me. I presented the video to a few people and went with it to a film festival in Sarajevo; it received very good reactions there. A British foundation decided to participate in the film after seeing a trailer. However, the crucial moment was in 2011 when the film got a co-production award from Robert Bosch Stiftung together with a grant of 69,500 EUR. This started the project and helped us shoot for three years without any considerable financial problems. Eventually it took you five years to finish the film. Why so long? One of the reasons was that at the same time we were also shooting a short fiction film with the same actors as in Drifter, including Ricsi. And why did it all take so long? We originally started editing the film after three years of shooting. Suddenly we found out that Ricsi's girlfriend was expecting a baby so the life of the main character took a different course. Obviously we wanted cover that; therefore, the period of shooting and also editing extended for another year and a half. As for the formal aspect of the film – was that clear to you from the beginning? I knew I did not want any interviews in the documentary; nor I wanted any staged moments. First and foremost I wanted to grasp the life of Ricsi and his family as authentically as possible. Therefore, I stayed overnight every time I went, and for three years I spent 2 or 3 days every week with them. In Ricsi's story spectators come across a bunch of universal life topics, from various aspects of maturing; an attempt to realize an seemingly unrealizable dream; attempts to get out of the field of parental authority to transition to adulthood, including the necessary take-over of responsibility for both his own and his child's life. What would you like the spectators to bring from your film? I leave it to them of course; I think you named all the fundamental topics of the film. Perhaps I would just add the complexity of the father-son relationship. Are you still in contact with Ricsi? What is he up to right now? Actually I'm just going to see him in his village. He's fine, he's just come back from Italy where he worked for a while. He also has a new girlfriend and is very happy with her. I know you studied psychology. I would like to know one thing: During the 5 years, have you ever felt that your camera changed their behaviour? Perhaps it happened so at the beginning for some time but I spent so much time there they slowly got used to me a lot. Therefore, they eventually did not notice the camera. Moreover, they were not sure there was going to be a movie out of the process so they behaved completely naturally, and I never felt they adjusted their behaviour or mutual relationships because of me. How complicated it is to get enough money for a documentary in Hungary? It is almost impossible for a beginner. When I started to shoot in 2010, the Hungarian film industry lost 20,000,000 EUR during a few years because of bad management. It smelled of dubious financial transactions but eventually, nobody was punished for it. The financial crisis contributed to it, and the result was that the film industry almost stopped for 3 years. In such a situation without a formal film education and as a beginner it was totally impossible for me to get any funding in Hungary. This was also why I chose to try documentaries: in contrast to fiction films I did not need a big crew; I did not have to pay actors; I could do most of the things myself. So I could get started on my own without funding from the state. Did the Hungarian National Film Fund decide to support your documentary ex post when they saw how successful it is? Fortunately they did. The financial support at home came last year when the film was finished, awarded at IDFA and a few other festivals. We again asked the Hungarian National Film Fund, and when they saw we already had considerable success with the film, and that there was a possibility of local cinema distribution, they eventually back the project and helped us to finance the theatrical release. We were very happy about that because we were in huge debts during the last 2 years of production and this also helped the film to get to the Hungarian public too.